There is no room quite like the nursery. Planning and designing a baby room can be exciting, yet also very overwhelming without the right guidance. Baby nurseries are warm and cosy, built by the amazing moments parents experience in this room. If you are stepping into parenthood, browse through many baby bedroom designs to explore and learn more about nursery guidelines. How do I pick a baby nursery design? Unlike a kid’s bedroom, the parents spend a lot of time in the nursery, so nurseries must be designed to please the adults as well. Don’t stress about the overall look of the nursery, since your baby might not remember the stylish room as much as the feeling of love and security. Start by adding essential baby nursery furniture sets that typically comprise of a crib or cot with nursery storage, such as a dresser and nursery wardrobe. Another popular piece to add is the rocking chair. Also, think carefully about how you design the room if you want to use it later as a toddler bedroom. Consider nursery ideas such as a cot bed which can transition to a toddler bed as your baby grows. Don’t forget to pay attention to the smaller details like blackout curtains to ensure your baby is able to sleep well. 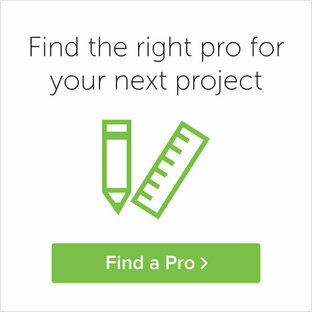 How do I decorate a baby nursery? When exploring baby room ideas, pick a theme that will endure your baby’s toddler years too. Nursery designs and decor for girls include florals, prints in bright and bold colours, and the themes for baby boys can range from sports to outdoors. If you prefer to go with neutral gender nursery designs, play with mixing shades of blues, greens, yellows and oranges, and bring in some metallic or wood accents to tie things together. 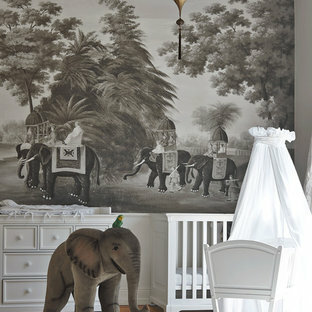 Animals and outdoor motifs, such as nautical or beach themes, are great neutral baby nursery ideas. You can incorporate the colours through wall decals, patterned curtains, bedding and soft furnishing. Also, don’t forget to include soft lighting for when you’re changing nappies or feeding in the middle of the night. Lastly, throw down a soft floor rug for when the baby starts crawling and playing. Design by Alice Lane Interior Design. Photos by Nicole Gerulat. Another sympathetically installed TV in this charming Nursery / Playroom is just the right height to be out of reach of sticky fingers. 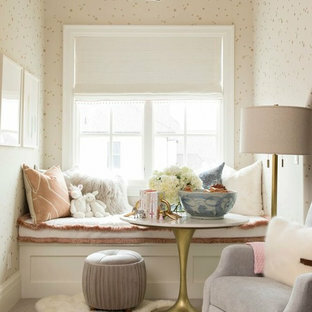 Sweet nursery with many shades of pinks and cream. The inspiration for the wall decal came from the client's existing crib. Pops of hot pink in the pillows, decal and chandelier keep the room fun! Children's room in Pavilion Blue with reading area furniture painted in Wimborne White.